Founded in Israel in 2006, ClickTale Inc. has grown quickly to become a leading name in the field of digital customer experience analytics. With growth of more than 5,550 percent in a five year period, ClickTale has garnered a number of awards for its business analytics solutions, including being listed by Red Herring on its “Top 100 Most Promising Companies in Europe, Middle East and Africa” in 2008. ClickTale’s digital customer experience analytics SaaS is designed for companies of all sizes, with unique features that reveal more about website visitors’ behavior and experiences than most of its competitors. Notable features go deeper than just tracking page-to-page navigation, and ClickTale includes playable videos of user browsing sessions, aggregated views of visitor browsing sessions in a heat-map format that can show you where the most people click or skip over, and how far down page visitors tend to scroll. Conversions tracking, such as the form analytics function, can help users better understand which form fields take too long to fill out or are left blank, and at what point potential customers abandon efforts and leave. Customers can also be segmented based on their behavior, including tracking abandoned shopping carts, site errors, and search failures. 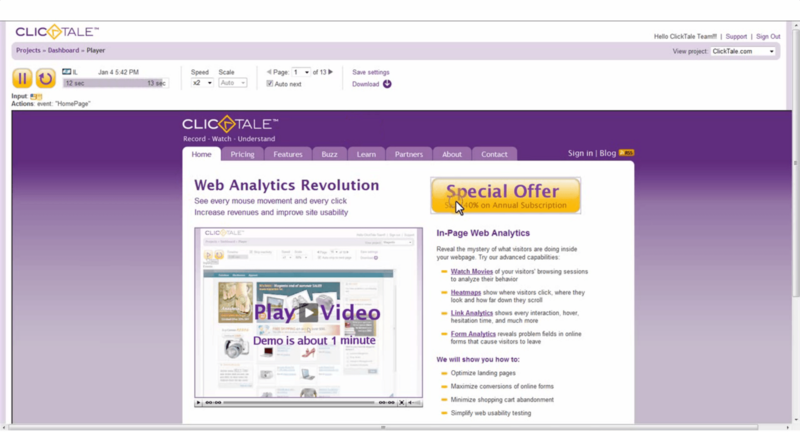 Serving more than 100,000 businesses worldwide, with a number of Fortune 500 names on its client list, ClickTale offers a no-strings-attached free plan that includes up to 5,000 recorded page-views per month and recorded visitor sessions. It also includes customized premium plans that feature “up to millions” of recorded page-views. Learn everything you need to know about ClickTale. Our experts will reach out to you shortly.